Pain in ribs and scapula on deep inspiration is usually caused by a subluxated rib; occasionally C5 needs to be considered. I have had pain behind my scapula near ribs 3,4, and 5 for 4 or 5 months now and it was getting better but is now getting worse again. I am a collegiate diver and do crossfit. It is not an acute injury, it began dull but became sharp and more focused. I have limited force exertion in my right arm and it hurts when I breathe and is extremely painful when I cough or sneeze. Hyperflexion of my shoulder gets nearly impossible when it flares up normally following a workout. I have been seeing a chiropractor for a long time now just for general health and to maintain mobility in my spine because I have scoliosis. He doesn't tell me what is wrong with it and hasn't retaken x-rays since this new symptom began to occur. Do you think I need to see a MD and do you have any idea what is wrong with me? I just need a second opinion without paying for another chiropractor unless that is what you recommend. I am overall satisfied with my current chiropractor besides the reoccurrence of this severe pain. Thank you very much for offering your input. On the face of it, you describe a common condition seen at the chiropractic coalface, namely a subluxated rib head. What doesn't fit though is that it's one of the simpler things we treat, usually responding very quickly. How about going for three consecutive treatments over 10 days or so and, if still not responding, then something further needs to be considered. Perhaps an x-ray, second opinion from another chiropractor or your GP. Tell your chiro, forcefully if need be, that it ain't getting better and you can't go on like this. Nor should you. I personally like to use a "anterior thoracic" technique, usually done lying flat on your back, or sitting. 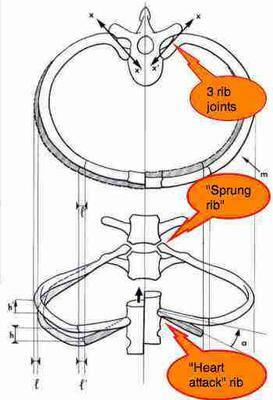 Are you getting referral along the rib, in the armpit, or to your breastbone?